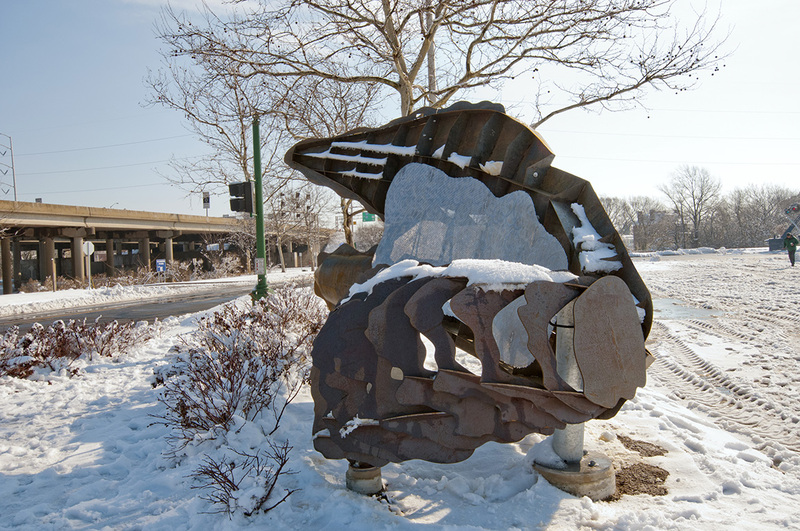 A series of three sculptures : Ship Shell ; 10’h x 16’w x 8’d, Signal Carrier ; 16’h x 14’w x 5’d , Stealth Reef ; 12’hx 12′-6″w x 4′-6″d. Materials : concrete, painted and galvanized steel, stainless, clear coated aluminum, weathering steel, glass, lighting on off-grid photovoltaic system. 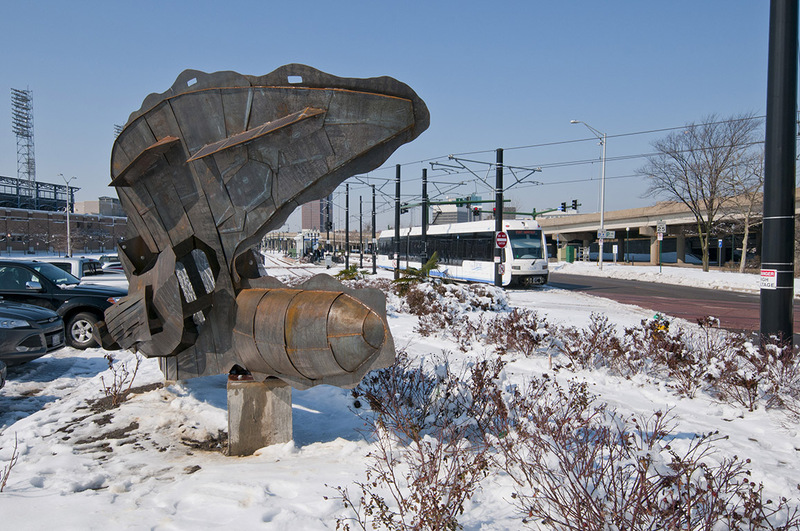 The Sculpture Series serves as both place marker and place maker, speaking specifically to Norfolk’s local history, transportation industry, and its estuary biology. 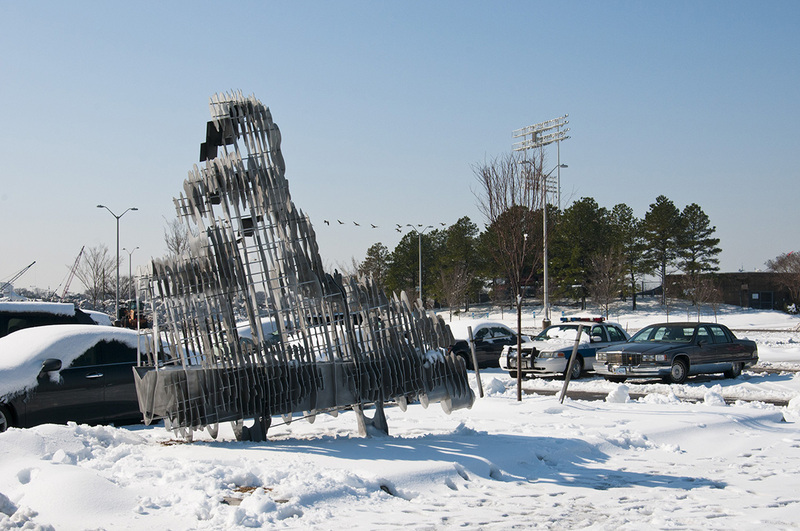 The sculptures are formed of stories that have filtered down to the present about large ships and oysters that grow from the waters of the lower Chesapeake. 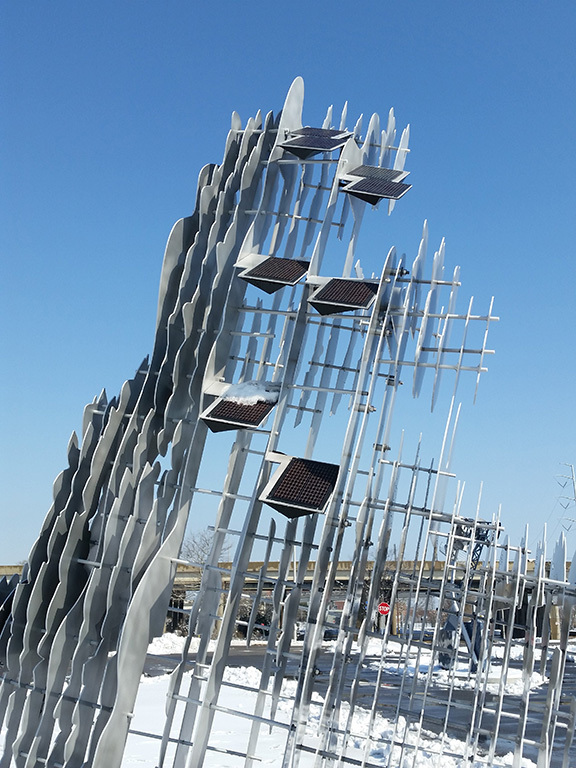 The sculptural intent is to point to a future of growth and innovation that is rooted in the diverse local ecology of industry and biology. A future and identity that is built out of retrofitting the past. Oysters are a keystone species of the region; a single oyster can filter 50 gallons of water a day. It is estimated that the oyster population, prior to colonial settlement, could filter the entire Chesapeake in approximately 3.3 days. The Ship Shell represents the history of boat and ship building innovations layered like the growth of an oyster’s shell. 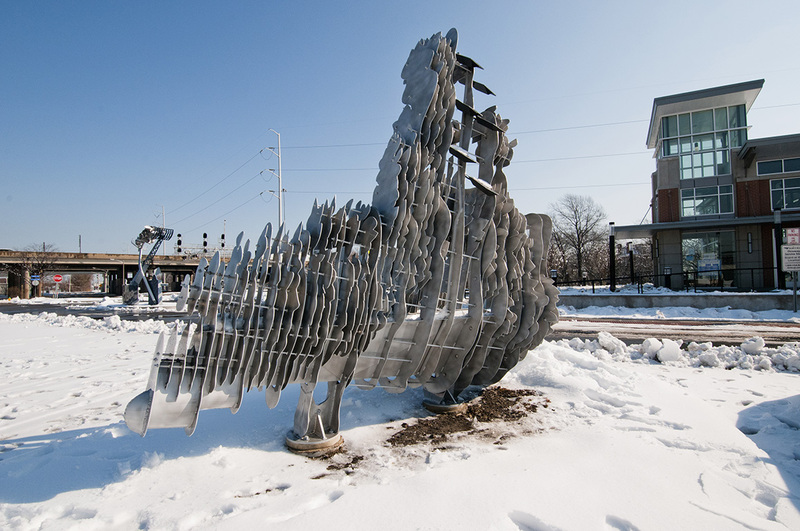 Norfolk’s railroad supported a booming local oyster industry that transported oysters to the West. 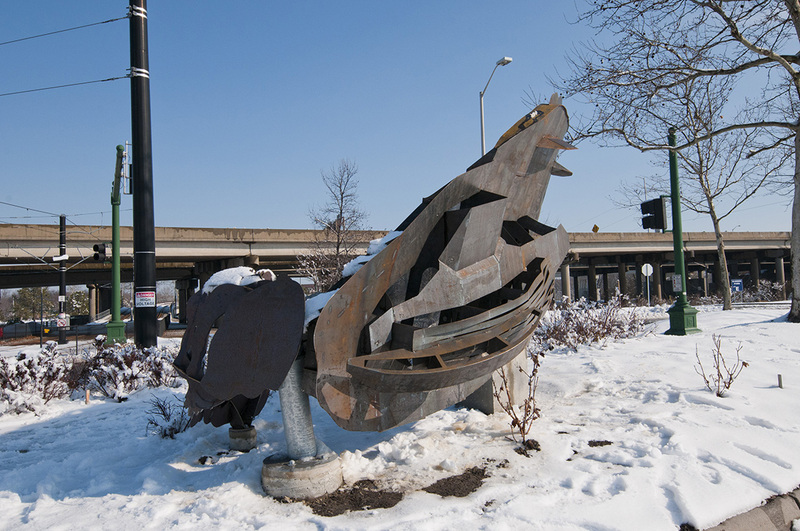 The sculpture’s outer “shell” is made of weathering steel that will naturally achieve a rust patina, conveying the passage of time. 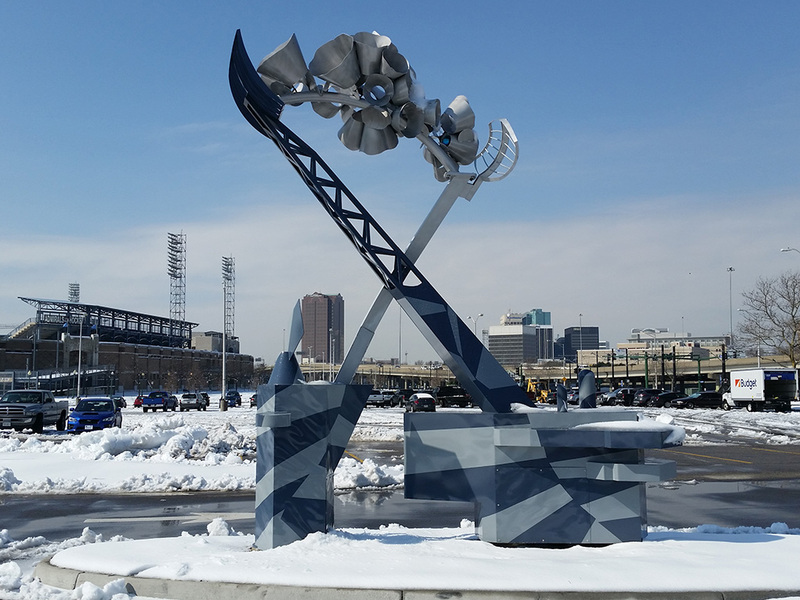 The steel structure is supported on a concrete pedestal that recalls rust streaked keel blocks and dry docks. 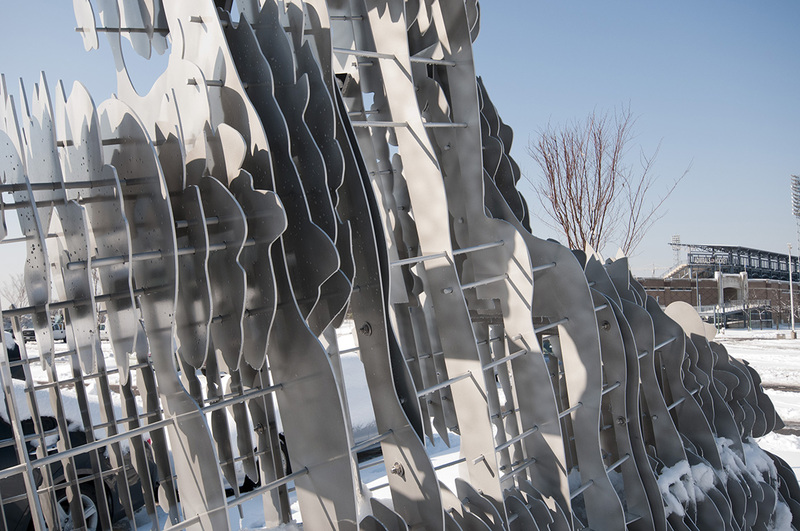 The sculpture’s interior space contains a perforated, polished and reflective aluminum “nacre” lining. Illuminated at night, the lining reflects and refracts light echoing an oyster’s contrasting rough exterior with its hidden inner beauty. 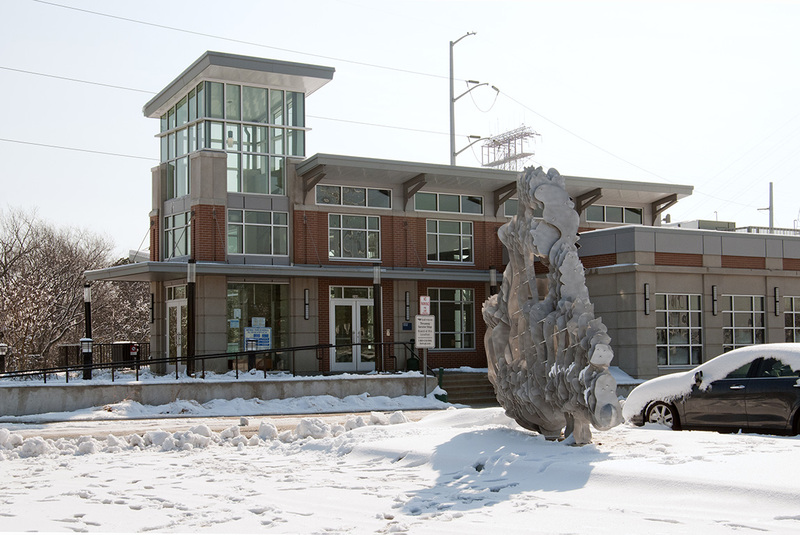 The Signal Carrier is located within the oval shaped median of the Amtrak station’s auto drop-off lane. 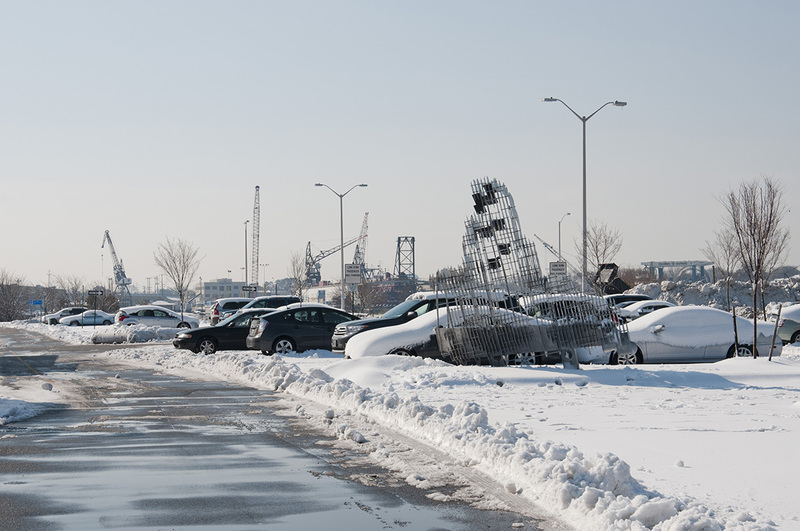 It co-opts the median’s oval shape to reference a ship’s deck floating in a sea of parking. Sitting atop this median-deck are two steel boxes based on the silhouette profile of aircraft carrier islands, profiles commonly seen in the Norfolk skyline. Viewed from the train a “razzle dazzle” camouflage paint scheme attempts to obfuscate the recognizable profiles. Rising out of the larger island is a truss or trestle form echoing the railroad draw bridge, railroad signal towers and radar masts. 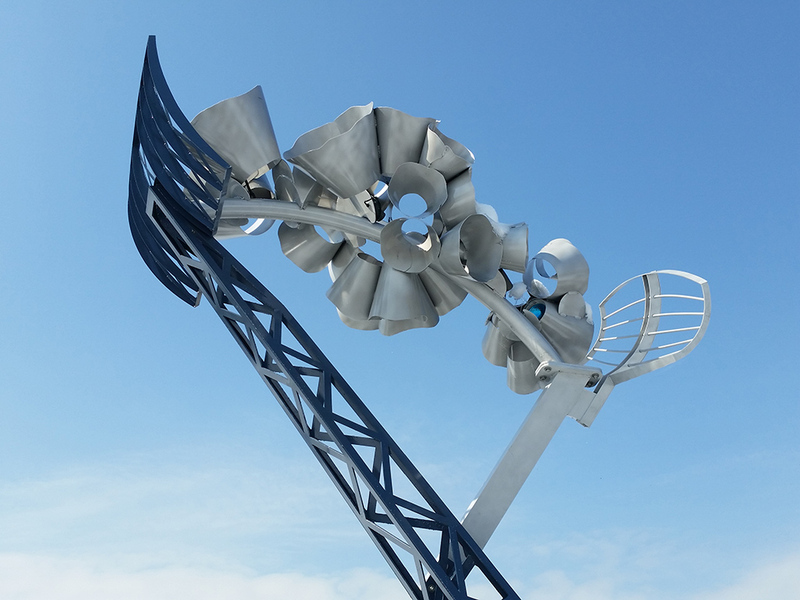 From the smaller island an aluminum “Oyster Tong” crosses over the truss to form a large “X,” its upper rake form framing a cluster of oyster like “signal” cones. Contained within the signal cones are three colored glass railroad Fresnel lenses, that, when illuminated at night, create a glowing set of signals. The Stealth Reef represents both the natural regenerative biology of Norfolk’s waterways and its great innovative ship building industry. 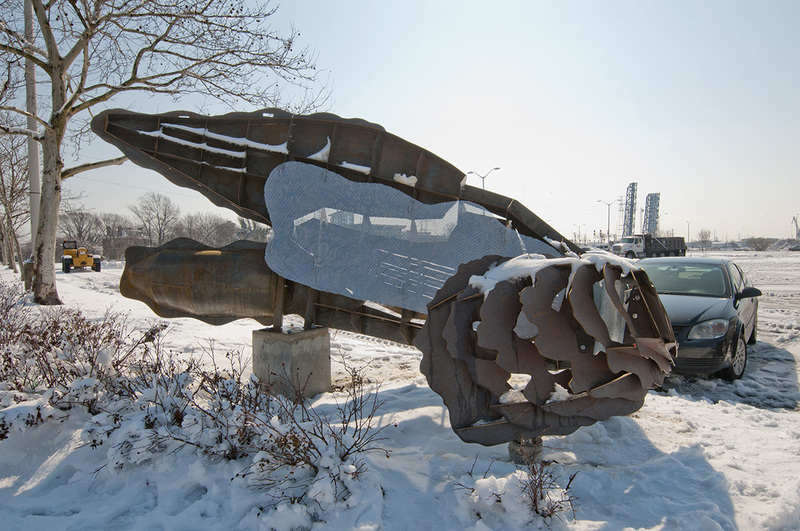 The sculpture’s form emerged while researching naval history. Rhiza came upon an ongoing tradition of recycling decommissioned naval ships by sinking them to become artificial reefs. We mused if the navy’s current cutting-edge stealth designed Zumwalt class ships would some day become a home to marine biology as well. Starting with a computer 3D model Zumwalt, we foreshortened the massive ship based on a one-point perspective from the bow– the only way to see such a large ship in its entirety (similar to the framed view of USS Wisconsin downtown). We then used an algorithmic computer script to generate and wrap the ship in an oyster reef. 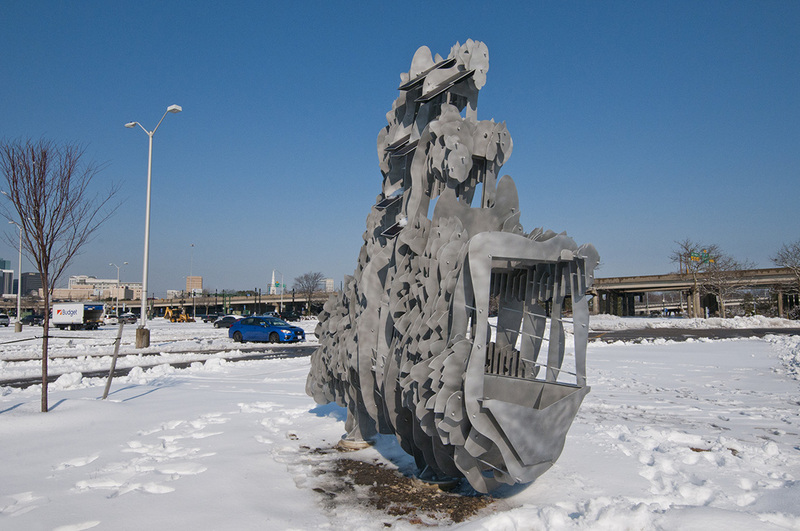 To develop the sculpture’s final form, the ship was subtracted away and the resulting reef was sectioned into 2D profiles. 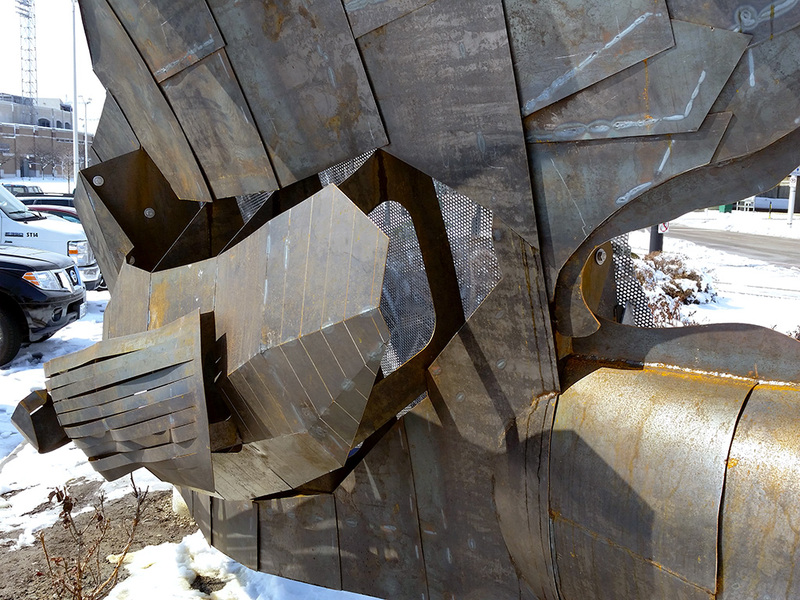 The ship’s hull below the water-line is all that remains visible, the rest of the ship is only seen as negative space looking through the open end of the sculpture. Light from inside the glass-bead blasted and clear gloss coated aluminum sheets refract and reflect a cool pearlescent light. 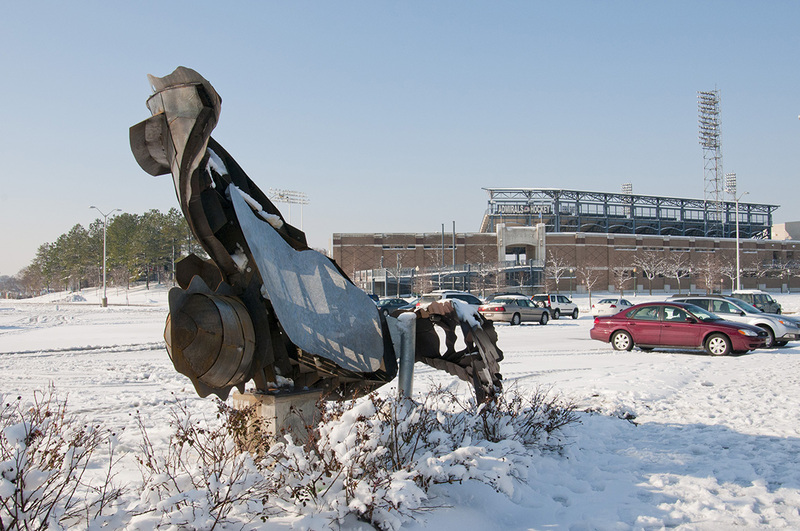 The Ship Shell responds to its site by taking advantage of both car headlights moving along Park avenue and the Tide train’s headlight reflecting off its interior perforated aluminum “nacre panel”. 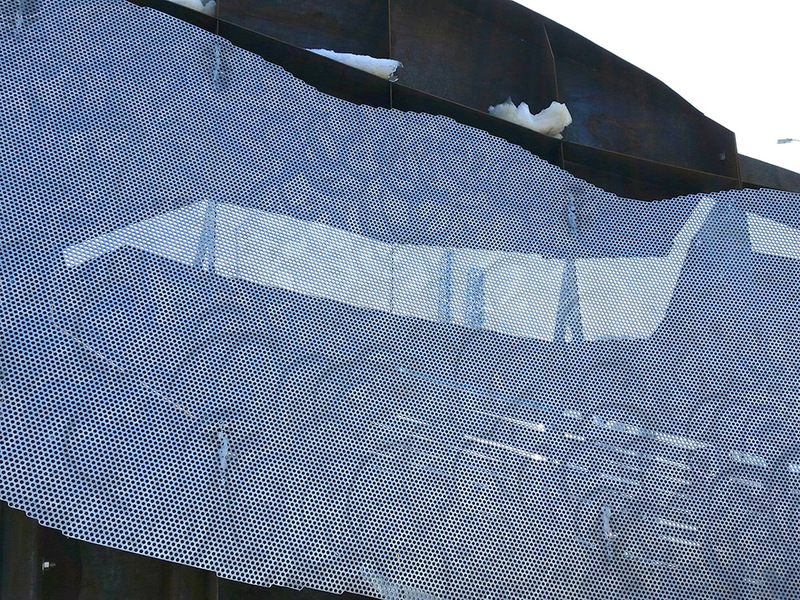 The south facing ship openings allow sun light to fall on the back side of perforated panel, illuminating the edges of ¼ inch holes. 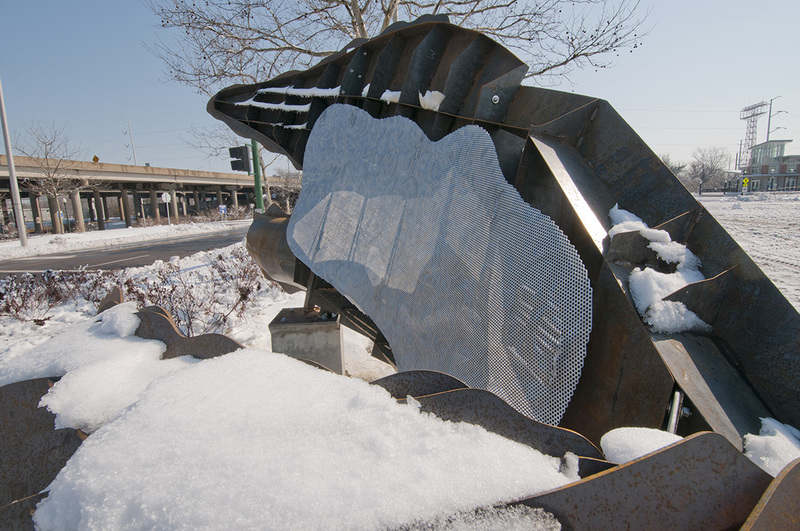 The smaller oyster shell form sits on the pedestrian pathway and is waist height to allow for clear views over and into the larger shell. 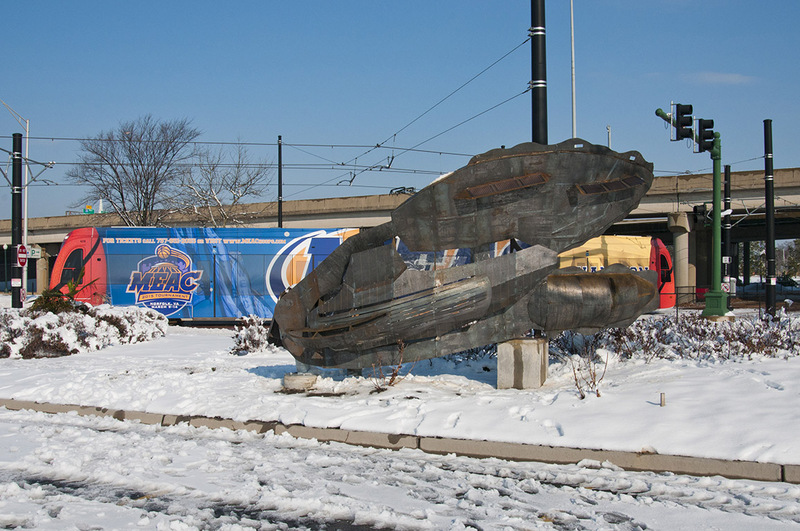 The large section containing ship forms faces the parking lot to provide a visual marker seen from the Amtrak station and Tide light rail station. Solar Modules are oriented to an approximate south and east sun exposure. 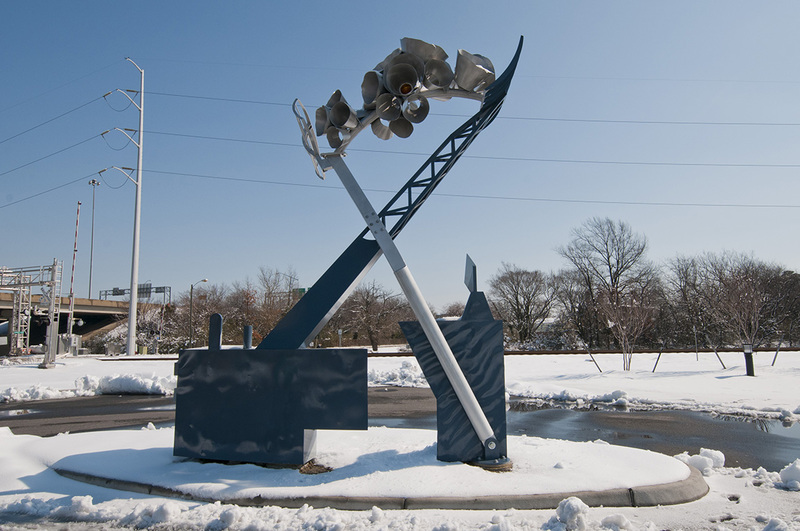 The Signal Carrier forms a large “X” shape, echoing the adjacent railroad crossing symbol, trestle, and signals. Its low, narrow base “islands” allow for vehicle sight lines around and above. 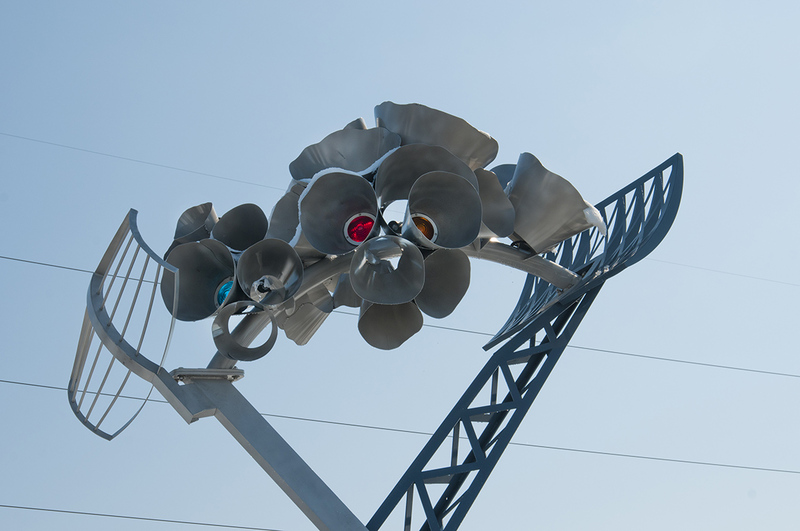 The upper cone section includes lighting that illuminates colored railroad glass signal lenses. This section is raised high enough to be visually set against the dark tree lined backdrop. 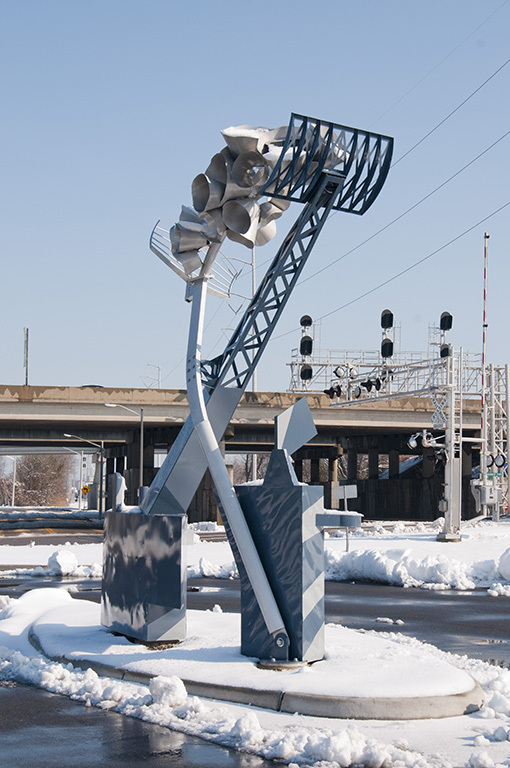 The “razzle dazzle” camouflage echos the Norfolk Southern graphic logo and is located on the slower moving railroad track and pedestrian side of median. 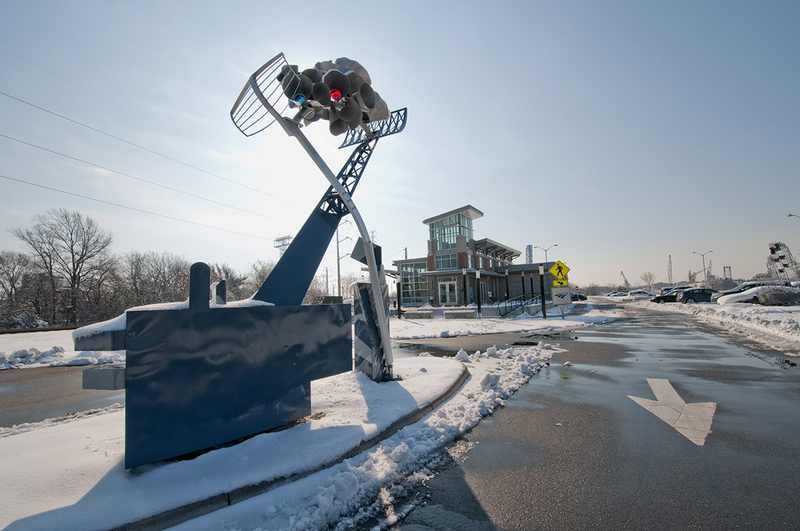 The Stealth Reef has an open viewing end that is aligned toward the Amtrak station’s front door and raised entry platform, providing views into the “stealth” negative shaped Zumwalt ship. 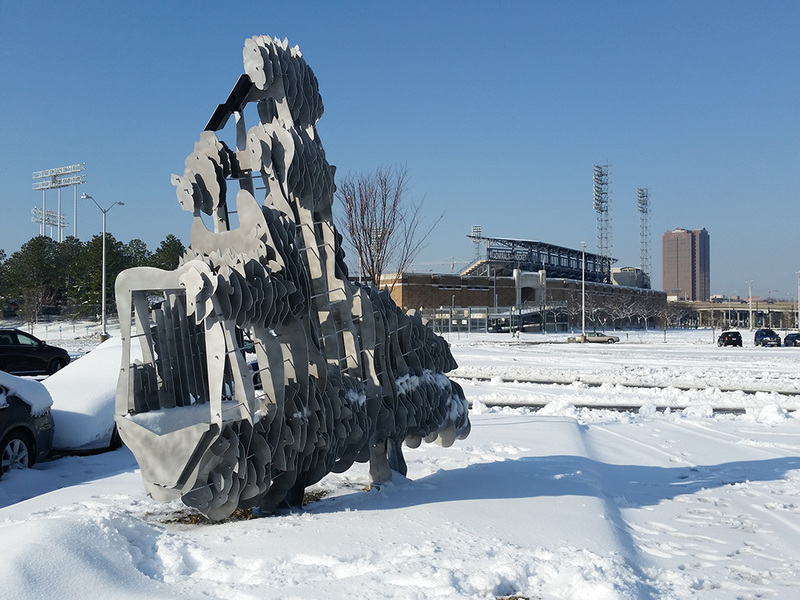 The edges of the sectional reef plates are oriented toward the street entry and median roundabout, this allows for views through the sculpture to the Elizabeth River beyond. 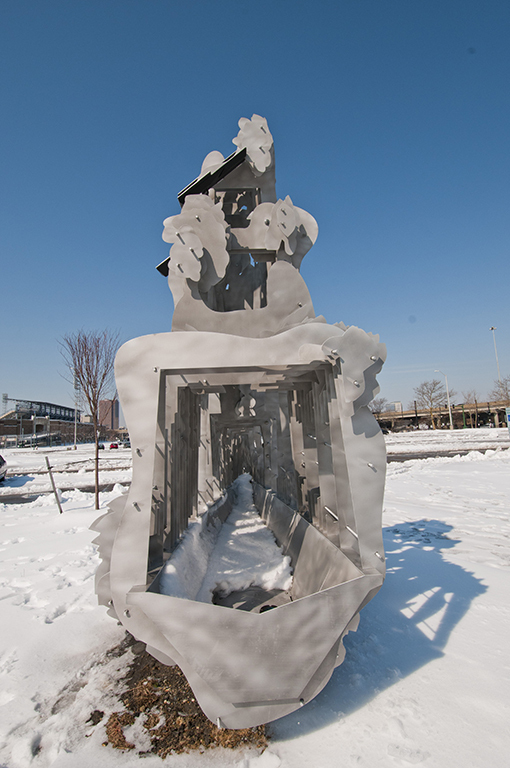 From the entry view the sculptures mass is intended to dissolve into an open screen.